Top Burgundy producers have become renowned the world over for their expression of the Pinot Noir grape. Over the last decade, a cult following from devoted wine lovers has blossomed into a worldwide phenomenon spearheaded by producers like Romanee-Conti, Leroy and Comte de Vogue, amongst others. We are pleased to offer an outstanding and exceptionally curated collection of Burgundy from the 1960s to the 2011 vintage. 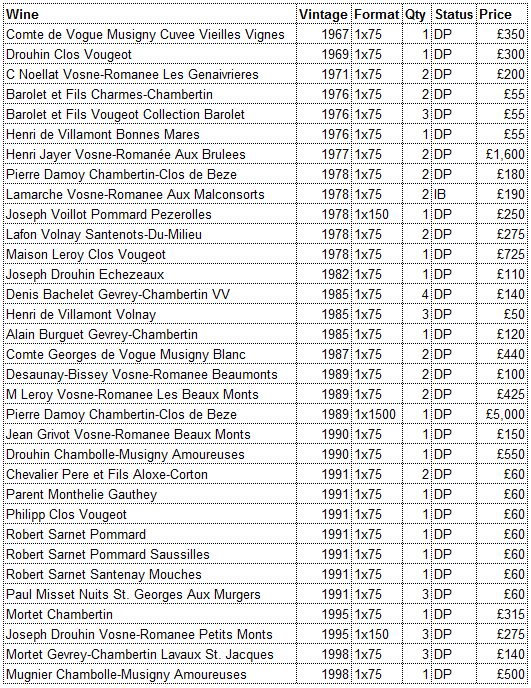 Part one will mainly focus on single bottles of Grand and Premier Cru wines ranging from 1967 to 1998. This collection provides the opportunity to enjoy a piece of history from Burgundy, there are few bottles left of many of these wines and they are all in their drinking window meaning supply will continue to diminish. The collection features famed producers such as Comte de Vogue, the powerhouse of Chambolle Musigny and owners of 80% of the fabled Grand Cru vineyard of Musigny. We have also included Henri Jayer, Jayer started life as a humble farmer and grew to be one of the most legendry winemakers in the world, pioneering techniques like cold-soaking and pre-maceration while insisting low yields are the foundation of the top wines. Following Jayer’s death in 2006, his family held an auction of his personal cellar in Hong Kong. A frenzy erupted, many wines sold for double their estimates and demand for the wines along with his legend was cemented. The collection offers wines from two of the greatest ever vintages, 1978 and 1990 rated five out of five by Decanter. Highlights include the following extraordinarily rare bottles, Comte de Vogue Musigny 1967 and Musigny Blanc 1987, two bottles of Henri Jayer Vosne-Romanee Aux Brulees 1977, a 15 litre bottle of Damoy’s Chambertin Clos de Beze 1989 and Maison Leroy’s Clos Vougeot 1978 and Vosne-Romanee Les Beaux-Monts 1989. Please do not hesitate to contact us, we would be delighted to provide you with further information and advice on the wines listed here and Burgundy in general. Quantities of these rare wines are strictly limited and will be offered on a first come first served basis.